APC1 antibody LS-C18983 is an unconjugated rabbit polyclonal antibody to APC1 (ANAPC1) from human, mouse, rat and other species. Validated for ELISA and WB. Amino acids 351-359 of Human Apc1 protein. This affinity purified antibody has been tested for use in ELISA and western blot. Specific conditions for reactivity should be optimized by the end user. Expect a band - 215 kD in size corresponding to APC1 by western blotting in the appropriate cell lysate or extract. Anti-APC1 pS355 Antibody - Western Blot. 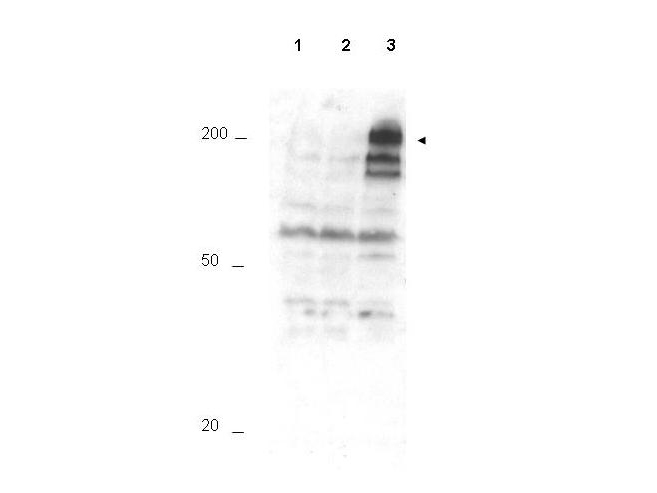 Western blot of Affinity Purified anti-APC1 pS355 antibody shows detection of a band ~215 kD corresponding to phosphorylated human APC1 (arrowhead). Lane 1 shows lysate from asynchronous cells. Lane 2 shows lysate from cells treated with thymidine to synchronize cells at the G1/S boundary. Lane 3 shows lysate from cells treated with nocodazole to synchronize cells at the M phase. Phosphorylated APC1 is mostly present only in cell preparations arrested at cell division. Each lane contains approximately 30 ug of HeLa S3 whole cell lysates separated by 12.5% SDS-PAGE followed by transfer to nitrocellulose. After blocking with 5% non-fat dry milk in TTBS, the membrane was probed with the primary antibody diluted to 1:500 for 1 h at room temperature followed by washes and reaction with a 1:5000 dilution of HRP Gt-a-Rabbit IgG [H&L] MX (LS-C60865) for 45 min at room temperature. ECL reagent was used for detection. Other detection systems will yield similar results. Data contributed by Bing Li, UT Southwestern.